Halloween is almost upon us, but everyone knows Halloween isn't just one day, No, it is the entire moth of October. You hit the haunted houses, decorate your home and stockpile bags of candy for yourself and the trick or treaters that will soon be banging on your door. But we are also compelled to watch as many horror films as humanly possible. Sure we might watch horror all year round, but when October hits it's like an unquenchable thirst for scares. 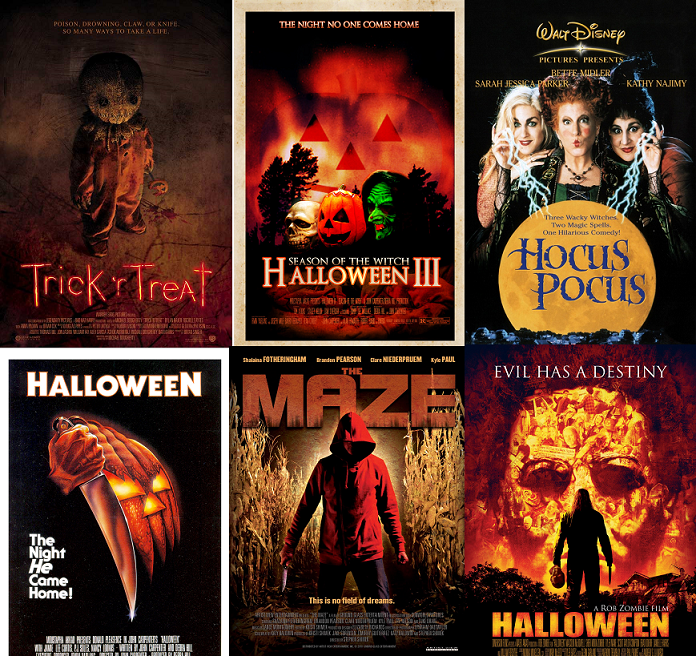 Now as I have done many times before, here is my list of the top 10 films to put you in that Halloween spirit. Five friends break into a closed corn maze in the middle of the night and decide to play a harmless game of tag. Little do they know that a psychopathic killer has decided to play along. As they wander aimlessly through the maze the murderer follows closely behind, taunting them and watching their every move. The game turns deadly when the kids decide to separate and weaken their chances of survival. When the mutilated body of the maze owner is found they realize that something is terribly wrong. As they race to find the entrance of the maze, the murderer cleverly forces them to follow the path that he wants. Manipulating everyone to his vicious will, the killer taunts his victims and leads them further into the depths of the maze. After succumbing to hours of torture will anyone make it out of the maze…alive? After a night of trick or treating, Sarah (Katie Maguire) is surprised to see that Tia (Sydney Freihofer) and Timmy (Cole Mathewson) have received an unmarked VHS tape in one of their bags. They decide to watch the video which contains three stories featuring a creepy clown (Mike Giannelli). The first features a young woman who is drugged and kidnapped by Art the Clown while waiting for a bus. She awakens chained in a room with two other women. Demonic creatures enter, killing two of the women and taking the third to a room where a devil-like creature rapes her. A humanoid fetus is then removed via c section by the creatures. The second features a woman living in a new countryside home who begins to experience strange occurrences. It's revealed she's being stalked by aliens, and as she's dragged off by the aliens, she grabs a sheet which pulls away to reveal a painting of Art the Clown. The final segment features a college student driving down an isolated road. Stopping at a gas station, she finds the attendant furiously kicking out Art who had apparently smeared feces all over the bathroom. The attendant fills her tank and goes inside to fetch her directions. When he doesn't return, the girl inspects to find Art chopping up the attendants body with a hacksaw. She flees and a chase ensues. Eventually Art catches her and she comes to on a crude operating table with her limbs cut off by Art. It ends with Art laughing silently but maniacally. Disturbed, Sarah attempts to shut off the tape but to no avail. Art then steps into frame in a dingy looking basement. He approaches Sarah from within the screen and begins to pound the television glass, ending when she pulls the TV cord. Sarah goes to check on the children only to find out that Art has murdered them. House of 1000 Corpses written, co-scored and directed by Rob Zombie. The film stars Sid Haig, Bill Moseley, Sheri Moon Zombie and Karen Black as members of the Firefly family. House of 1000 Corpses is set on Halloween, and sees the Firefly family torturing and mutilating a group of teenagers who are traveling across the country writing a book. The film explores a number of genres, and features elements of the supernatural. Zombie cited American horror films The Texas Chain Saw Massacre (1974) and The Hills Have Eyes (1977) as influences on House of 1000 Corpses, as well as other films released during the 1970s. The movie served as Zombie's directorial debut. A loser finds out the hard way there are worse things than spending another night at home in this horror comedy from first-time director Jeremy Saulnier. Christopher (Chris Sharp) is a nebbish who can't get any respect at work, couldn't get a date if his life depended on it, and has practically no social life. Christopher figures he's going to be stuck at home on Halloween until he finds an invitation for a "murder party" on the sidewalk; expecting a costume party with fun and games, he slaps together a cardboard "suit of armor" and shows up for the festivities. The bash is being thrown by a group of bohemian artists who are rather surprised Christopher has shown up -- he's the only stranger to take the bait and arrive for their party, in which their guest-of-honor is actually going to be killed in the name of creativity (and impressing a jaded patron who finances their projects). Before long, Christopher begins to realize what's going on, and struggles to find a way out of the warehouse where the party is being held, while the artists begin to turn on one another and the blood starts to flow. Hospital emergency room Dr. Daniel "Dan" Challis (Tom Atkins) and Ellie Grimbridge (Stacey Nelkin), the daughter of a murder victim, uncover a terrible plot by small-town mask maker Conal Cochran (Dan O'Herlihy), a madman who's planning a Halloween mass murder utilizing an ancient Celtic ritual. The ritual involves a boulder stolen from Stonehenge, the use of Silver Shamrock masks and a triggering device contained in a television commercial -- all designed to kill millions of children. Trick 'r Treat delves into the four stories that make up the feature film, Trick 'r Treat releasing in October 2007. It reflects Dougherty's personal take on the filmmaking process, details how the ideas and art came together, and presents it with exclusive special features in a unique format. The genre encompasses drama, horror, thriller...mixed with a good dose of twisted humor. Set in a small suburban town, Trick 'r Treat explores Halloween traditions while following a group of people trying to survive the most terrifying night of the year. From a serial killer who specializes in poisoning candy; to a group of mischievous kids who unearth their town's dark secret; to a young woman hunted by masked stalker at the local festival; to a cantankerous old hermit confronted by a demonic trick-or-treater, the film is filled with horrifying surprises, nervous laughs and strange creatures of every variety--human or otherwise.